I'm taking part in a market day on the 19th with a group of other rad people. There will be 14 designers with a wide array of fabulous creations. Come and see the ceramics, glass, jewellery, knitted goods, paintings, amazing clothing, cool kids toys, baby carriers and vintage accessories, and much more! Free champagne and delicious sushi. Thanks, Look forward to seeing you all there! 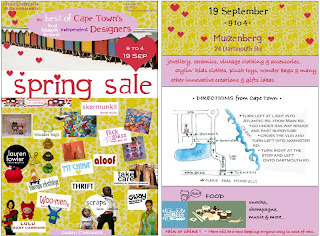 From 9am to 4pm at 24 Dartmouth Rd Muizenberg. please check out our flyer for details..
And take a look at our link to the previous sales. come by, it's gonna be a "jol"